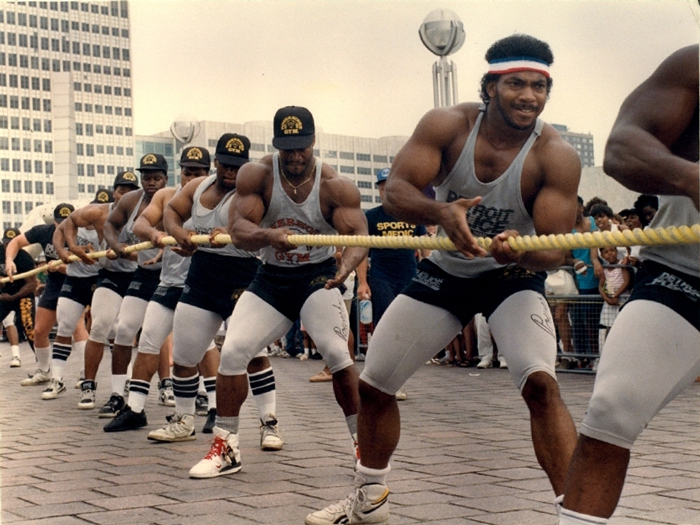 I recently found this snapshot of the defending champion 1991 Detroit Police Department tug-of-war team opening the Detroit-Windsor International Freedom Festival with a tug-of-war match-up against a team in Windsor. That's right: that rope is stretching across the Detroit River and the other end is presumably held by mounties. In uniform. Because picturing these incredibly muscular fellows battling uniformed mounties in an international tug-of-war competition where the losers topple into one of the world's busiest shipping lanes is something that will brighten this day and many more to come. I wonder if there are any ringers in that lineup, because I don't know if a standard-issue police uniform would actually fit over those guns. I'm talking about you, Patriotic Headband and guy behind you. I know you want to believe that some shiny mountie boots ended up in the water that day, but sadly in 1991 Canada prevailed for the first time and pulled that 1,000-foot rope across the river the fastest. Here is a blurb about the team from the August 30, 1954 issue of Sports Illustrated (back when SI covered topics like municipal police force tug-of-war competitions). 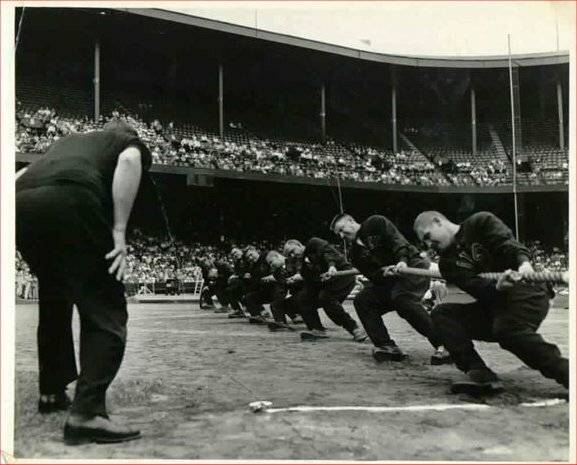 "TUG OF WAR pit two tons of the Detroit Police Dept. at the opposite ends of a rope at the University of Detroit Stadium to warm up for their part in the 28th annual Detroit vs. Toronto police track and field games. 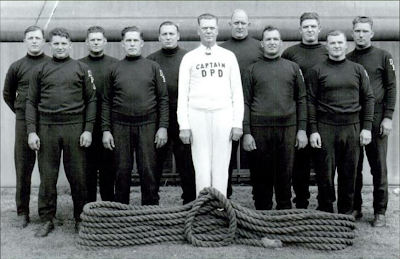 Average weight of the 17 patrolmen practicing above is 260 pounds, not counting Coach Norman McCorry (center), no lightweight himself. During the actual meet, a few days after this picture was taken, close to a ton (seven) of the husky Detroiters heaved slightly to tug Toronto police off their feet in two tests. The first required 19 seconds, the second 21.1 seconds. 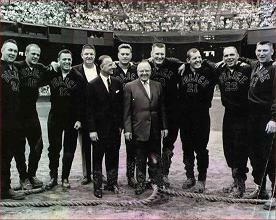 It was the 14th time in 14 years that Detroit has won the annual tug of war. Some 14,000 spectators watched the event. And this Jam Handy video has some archival footage of a team from that era in action. 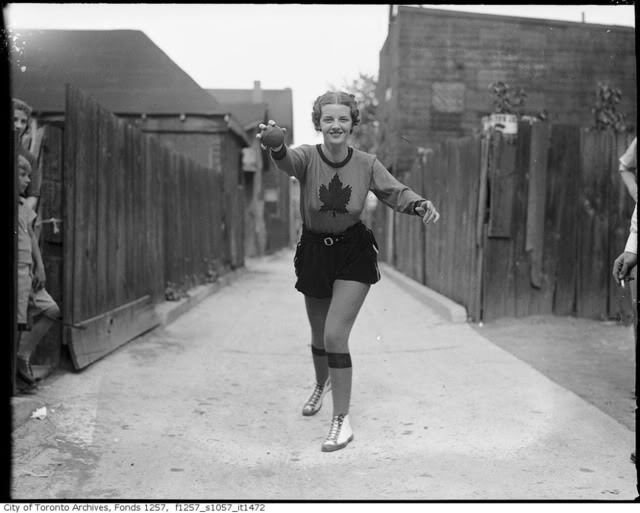 Maybe the winners got to play back-alley bocce ball with Miss Toronto?